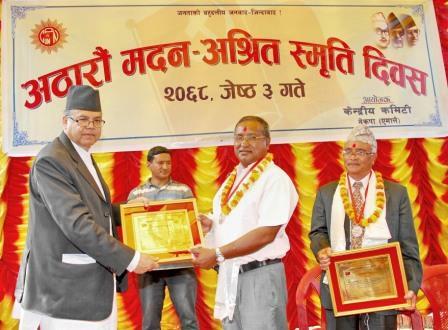 We at AwF are pleased to inform you that Dr Madhav Shrestha, who co-manages our AwF-Nepal project, has received an award from the Prime Minister of Nepal for his continuous dedication and contributions to Agriculture / Aquaculture Development in Nepal. Dr Shrestha was recently promoted to full Professor at the Institute of Agriculture and Animal Sciences (IAAS), Chitwan, Nepal. In addition to these, he has been very successful in winning funding for a number of projects from national funding agencies and successfully launching them for the benefit of local communities throughout the country. He was also the key person who organized a national symposium on ‘Small-Scale Aquaculture in Nepal’ during 5-6 February 2009. The award ceremony was held on May 17, 2011.